1. Its for free. So you need to make any quick image edits, just visit this site, load the image from you computer and start editing them. 2. The User Interface (UI) of this tool is based on Photoshop GUI (but more simpler) and it has lot of features similar to Photoshop. 3. Plus they have introduced many a new features which is not even there in Photoshop. These guys at Sumo Paints have really worked hard and it shows. The "Learning Flex From Scratch" series written by Adam Flater and Scott Sheridan, aims to help not only a Flex novice, but also a programming novice jump into the world of creating Rich Internet Applications using Flex. The installments of the series will cover everything from installing the Flex Builder I.D.E., to some background information on object-oriented programming. You'll even get to learn about advanced topics like source control and design patterns (a la Cairngorm) from the perspective of a beginner. Hey I just earned myself a Web 2.0 Master's Degree!!! If you guys wanna be a Master too in Web 2.0 then click on the icon above. If you are finding it difficult to keep up with all the new web tools, trends, techniques, tutorials, articles etc. then here is a simple technique which I use to keep myself updated. But to use this technique you need a few tools. 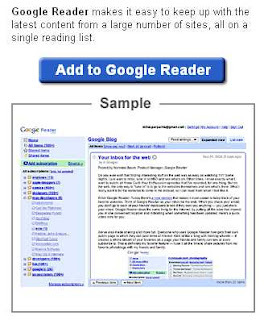 GoogleReader where all you daily updates from various blogs will come.Igoogle with GoogleReader Widget (for viewing your daily updates without login separately to GoogleReader). Mozilla FireFox Browser (for subscribing to these blogs). A list of personal or community blogs you wud like to receive updates from, everytime a new post is added. 1. Locate the subscribe to link or rss icon on the blog page. 3. 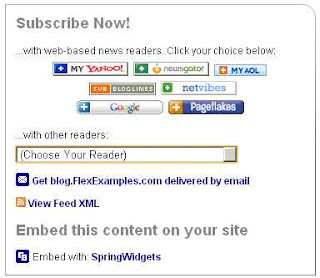 Clicking on the subscription link or rss icon will take you to a page where you need to select the news reader of your choice. In our case we will be selection Google. 5. 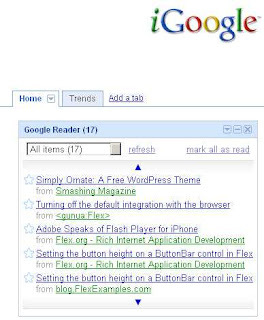 Finally, you need to have a igoogle widget for GoogleReader, so that every time you launch your browser, (with google as your homepage) you will be able to read the updates on your favourite sites by browsing the links in your GoogleReader widget. Thats it, now every time you open your browser all the new posts from your favourite blogs would be there right in front of you for you to read. Just a word of caution: dont over-subscribe to all possible blogs you come across. Make sure you subscribe to a few but important blogs, that way you will not be burdened with the task of reading your updates on time.